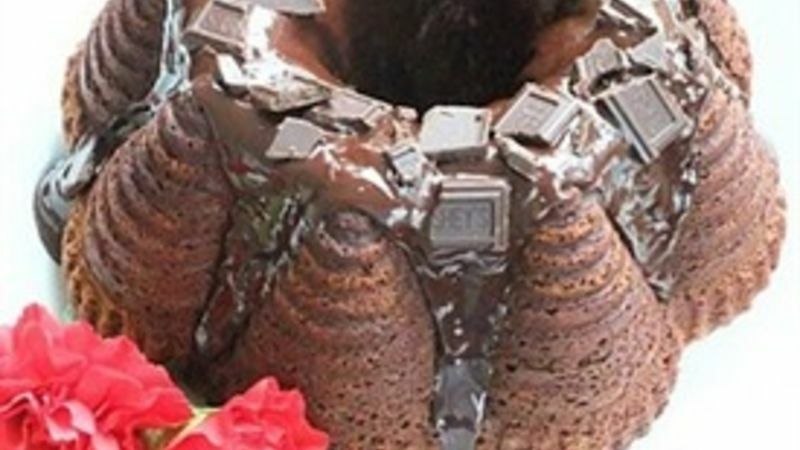 Grease a 12-cup Bundt pan, and dust with cocoa, set aside. Combine cake mix, sugar, and pudding mix in a large mixing bowl. Beat eggs and next 4 ingredients at medium speed with an electric mixer until blended. Gradually add oil mixture to dry ingredients; beat 2 minutes. Coarsely chop 3 chocolate bars, fold brandied cherries and chopped chocolate into batter. Pour batter into prepared pan. Bake at 350° F for 1 hour or until a wooden pick inserted in center comes out clean. Cool cake in pan on a wire rack 15 minutes. Remove from pan; cool completely on wire rack. Coarsely chop 1 chocolate bar. Place chopped chocolate and butter in a small bowl; set aside. Bring whipping cream to a simmer in a small saucepan over medium-high heat. Remove from heat, and immediately pour over chocolate and butter. Whisk gently until smooth. Cool glaze 3 minutes or until slightly thickened. Drizzle glaze over cake. Coarsely chop remaining chocolate bar; sprinkle chopped chocolate over cake. Yield 12 servings.